2. It presented new issues that now need answers. The way I see it, Mr. Abedini explained away facts about his conviction on misdemeanor domestic assault charges in 2007. He said, “I think the court made a mistake.” But, he also did not give enough detail to his response to Ms. Beaty’s question about the case to figure out what (specifically) he meant by that. He has more explaining to do on this account. [CT] Can you talk about the misdemeanor domestic assault charge in 2007? You pled guilty to that, and that suggests there was at least one instance of marital abuse. 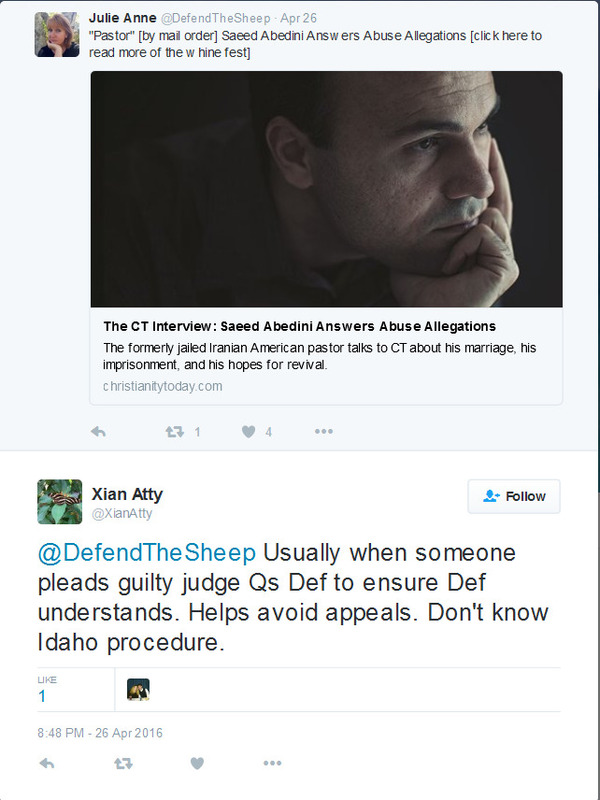 [Saeed Abedini] I believe courts can make mistakes too. They are not God; they can make a mistake. I talked with Franklin Graham. He asked me to keep silent and not say anything about anyone. Graham encouraged me, “Let other people defend you.” I think the court made a mistake, and I didn’t know that I’d been guilty until three weeks ago. I didn’t know that I got a sentence of 90 days in court until three weeks ago. No one told me. I personally took the above screen capture on February 2, 2016. This same shot was posted in a Spiritual Sounding Board article that same day. An earlier version of the same register, but with a wider right-hand margin, was posted on The Wartburg Watch on January 31, 2016 – the same day I took that screencapture. 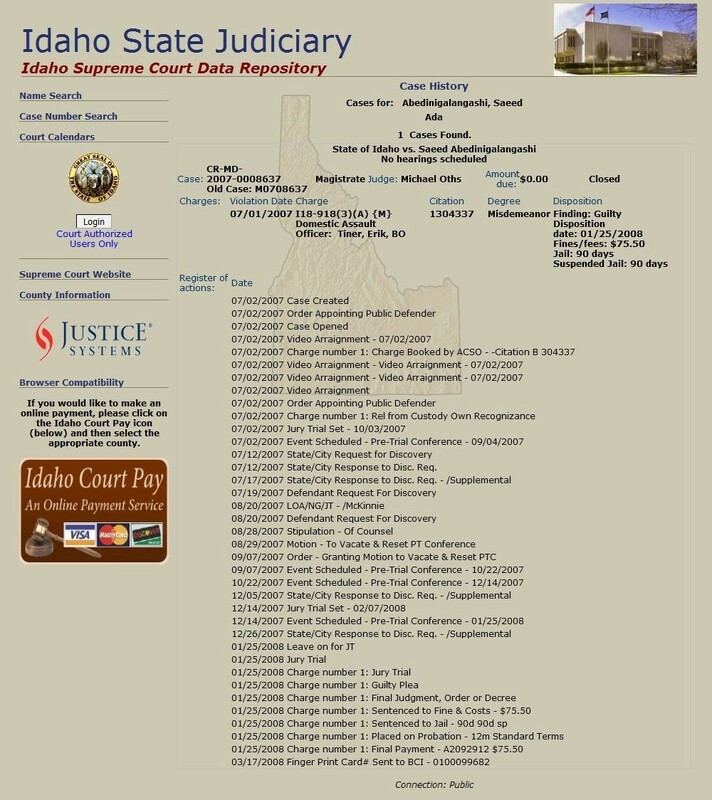 To my knowledge, these were the first screenshots of the court case ROA (Register of Actions) posted online. In 2007, Saeed pleaded guilty to misdemeanor domestic assault in Ada County Magistrate Court. He was sentenced to 90 days in jail, which was suspended, and placed on probation for a year, according to online Idaho court records. The case file was not immediately available for review. Examine the details on the court ROA. The criminal charge of misdemeanor domestic assault was filed on July 1, 2007. The case was created the next day. There are additional entries for July, August, September, October, and December of 2007. Disposition of the case occurred on January 25, 2008. Fingerprint cards were sent in March of 2008 So, the entire court case from initial citation to final disposition was seven full months. He did not understand on January 25, 2008, that he/his lawyer submitted a guilty plea? He was not told the judgment against him, that he’d been found guilty? He did not understand the consequences of being guilty: suspended jail time, or that he was being placed on probation, or why he was making a payment for fines and fees, or why he was being fingerprinted? Last week, the Idaho Statesman reported that Saeed pleaded guilty to domestic battery following a July 2007 incident at the couple’s West Boise home. The Statesman this week obtained a copy of the incident report from the Boise Police Department, following a public records request. It reveals that Saeed Abedini got into an argument with his wife and shoved her several times during an incident at the couple’s West Boise home on July 1, 2007. The argument came while Saeed, then 27, was speaking with family members. Naghmeh, then 30, got upset at something he told his family and tried to close the laptop computer he was using to talk with them, Saeed told police. A description of the argument was redacted in the copy of the report provided to the newspaper. When [police officer Erik] Tiner asked what she wanted done, Naghmeh told him that “she wanted him to go to jail for domestic battery.” She then signed a criminal citation. Saeed was arrested that day and taken to the Ada County Jail. Following a video arraignment the following day, he was released on his own recognizance. During court proceedings, Saeed was assisted by an interpreter who spoke Farsi, the Persian language of Iran. Saeed initially pleaded not guilty to the misdemeanor charge, but changed his plea to guilty on Jan. 25, 2008, according to court records. He was given a suspended 90-day jail sentence and fined $76. He was placed on probation for a year by Ada County Magistrate Michael Oths. Saeed was also ordered to attend eight hours of sessions on anger management. He completed that requirement before entering his guilty plea, records show. Neither Saeed nor Naghmeh responded to requests for comment for this story. Mr. Abedini switched pleas from not guilty to guilty, but apparently didn’t know that meant he was agreeing to a criminal charge? He attended anger management sessions before he switched his plea, but apparently didn’t know how that related to his plea? Seems to have misrepresented the court process. Apparently accused his wife of (1) tricking him when he pled guilty to the charges and (2) helping perpetrate fraud on the Idaho State court system. Apparently accused his attorney of serious malpractice. 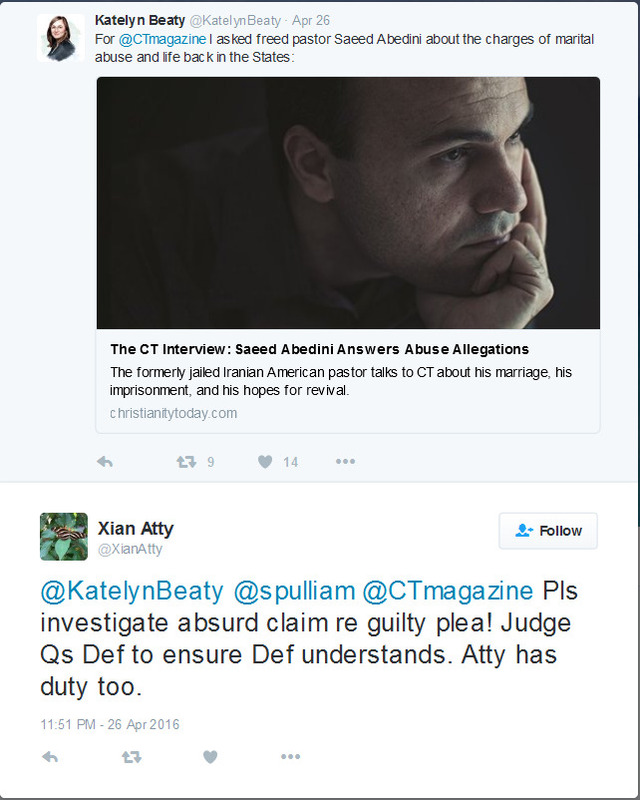 @XianAtty called on Christianity Today to investigate the matter (see Tweet #2-3 below), but there has been no response yet. Links: Tweet #2-1. Tweet #2-2. Tweet #2-3. Tweet #2-4. Tweet #2-5. Tweet #2-6. 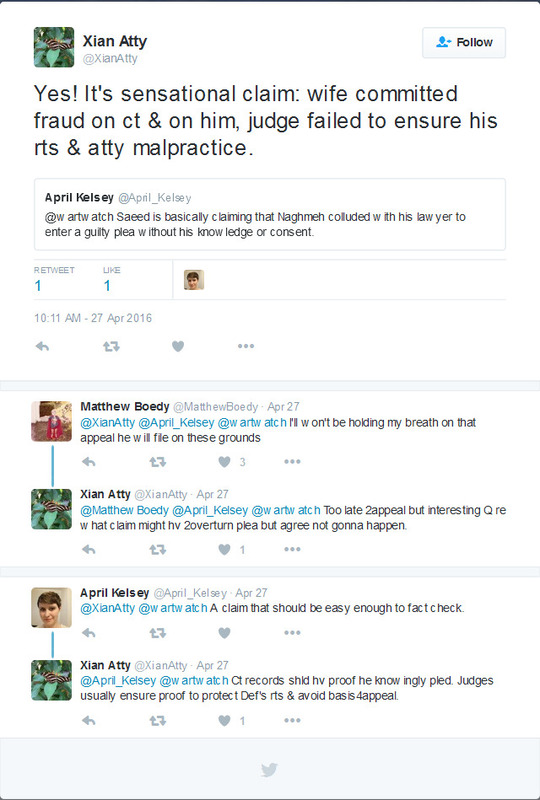 What do you make of those challenges to Mr. Abedini’s statements, posted by someone who presents himself/herself as a Christian attorney? Is Mr. Abedini telling the truth? Is Mr. Abedini making things up? Is Mr. Abedini not remembering right? Is Mr. Abedini suffering from post-traumatic stress disorder, and that’s affecting his recollections? Is something else going on here that we have not yet discerned? How does this qualify as responsible journalism? Did it make a complicated situation more clear for their readers, or more cloudy? If it did create additional problems, how should CT rectify this lapse? What could/should readers do if CT lets the implications stand as-is? Previous postChallenging Christianity Today’s Interview with Saeed Abedini – Part 1 of 3: Introduction, and He Gave No “Answer” to the Allegations. Next postChallenging Christianity Today’s Interview with Saeed Abedini – Part 3 of 3: Apparent Assumption of Trustworthiness Left Unexamined, and Final Thoughts. I am wondering what sort of agreement CT had with Saaeds handlers before all this came to light. The Christian industrial complex had big plans for Saaed and not only money to be made for all involved but coalition building around a true persecuted hero. As the back story comes out and we meet the real Saaed, it had become somewhat of a macabre, seemly reality of a narcissist blaming Satan for all his self inflicted woes. I was ready to write up a post about Saeed’s words in the CT article and what didn’t sit right with me. Then Brad, you said you were going to do a write up, so I thought I would wait and see what you said. Maybe I can piggy-back some of my thoughts into the comments here. Saeed shows no concern for his wife or children. Everything is focused on him. I was waiting for a welcome home, but I didn’t get that. I was hoping to rest, but I don’t get to do that. I still can’t feel my freedom; I still feel like I am in prison. He feels bad for his supporters because they were not able to celebrate with him. Does he really think that those who sent over “100,000 letters a month” to the prison and prayed for him were not rejoicing that he was out of prison? He is projecting his disappointment on to those who were praying fervently for him. I want to know how one who so passionately supported his efforts for freedom feels about this statement. He blames everyone but himself for what his happening. 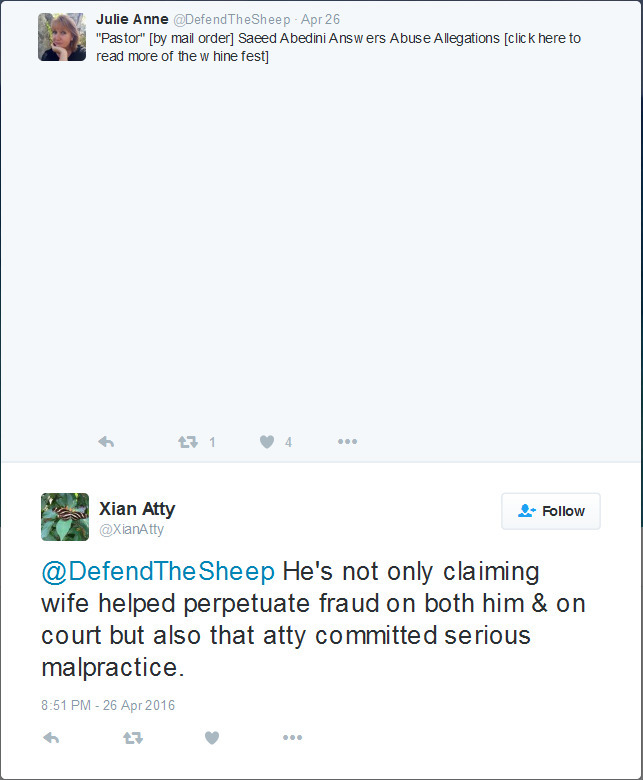 Satan (check), his wife (check), the court (check), his lawyer?? (check). “Everyone is confused” (from CT article) – Unfortunately for Naghmeh, of course everyone is confused. Everyone thought he was merely a pastor being imprisoned for the Christian faith. No one could have ever imagined that he was an abuser. He stated that Franklin Graham encouraged him to “let other people defend you.” Was this during his trial or when he returned to the U.S. recently? If this was during the trial, what was his connection to Franklin Graham? He says that his conversion experience includes him having a thought of killing a pastor and hearing voices from God. This reminds me of Saul’s/Paul’s experience. At the end of the article he’s starting to sound like Franklin Graham: America needs a revival, Christians can influence the President and Americans are thirsty for a change in politics. Some very good points there, Kathi. When I was typing this out, I used numbers for my points, but WordPress changed it into letters. Strange. 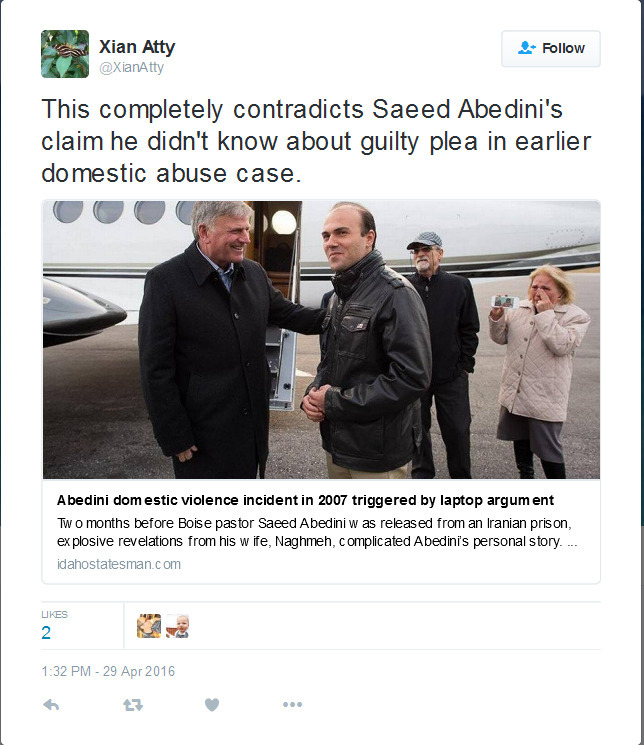 @lydia00 — It seems all the “handlers” started disappearing once the allegations of abuse were public, Saeed Abedini returned to the U.S., but Naghmeh Abedini stayed steadfast in following a course of setting appropriate boundaries. There is no point-person or covering of any kind for Saeed now except himself — and maybe some management from Premiere Speaking. But he does seem to have almost unconditional backing from conventional Christian media, and him getting the equivalent of a free pass when he makes so many disturbing statements and accusations is itself disturbing. For readers who may not be familiar with Narcissistic Personality Disorder, there is very helpful material at the Out of the FOG website. The following page gives an overview and then key traits, each of which links to a page of more detailed info. Here’s the profile of NPD, and the criteria that qualified psychological evaluators use in making a diagnosis. I see how a lot of the points you’ve made, Kathi, fit with the psychological profile. P.S. It turned the 9-point list of NPD criteria into a lettered list. What’s with that? Spot on about Saeed being a Diotrephes — always wanting to be first. I think the court made a mistake, and I didn’t know that I’d been guilty until three weeks ago. I didn’t know that I got a sentence of 90 days in court until three weeks ago. No one told me. This guy would fit in perfectly at Shawshank. Saying the court erred when he plead guilty reminds me of guys who say they were misquoted in their autobiographies.